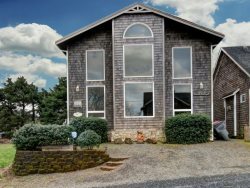 It’s windows, windows, everywhere – and the stunning coastal views to match – in this sweet and cozy three-bedroom oceanfront home. Purdy House offers guests the best of both worlds: it’s situated a few blocks away from busy Hemlock Street with all its fantastic shops and restaurants, but set so close to the shore that you just may forget about everything except the sea and its tranquil rhythms. Mere steps from the sand, this treasure of a home offers five-star views of Haystack Rock and the surrounding shoreline in classic cedar shingled style. It’s beach charm paired perfectly with an interior as fresh and clean as a coastal summer morning. A flat-screen TV, lots of outdoor living space, and plenty of indoor communal areas make unwinding here a breeze. The simple kitchen and dining area offer unfettered coastal views, while the living room boasts a unique circular stone fireplace that warms the entire living area – and plenty of seating for beach-goers nestling in of a cool coastal evening. There’s also a second, smaller seafront dining table, perfect for sitting to down to a puzzle with a few favorite friends, your hands wrapped around a mug of something warm. When the temperature rises, you’ll want to make good use of the back deck, which offers a healthy dose of oceanfront breezes and views, set against a private yard with its own beach access. A second small back porch comes equipped with a gas barbecue perfect for grilling. You’ll sleep like a baby in any one of three cozy, wood-paneled bedrooms, two with Queen beds and a third with two single beds (there is also an Aerobed for the kids). The home is playfully outfitted with beach art, from old prints of shipwrecks and beloved Cannon Beach views to hanging kites. Purdy House’s close, amiable quarters and fantastic communal spaces make it the perfect getaway spot for a group of close friends or family interested in bonding and reconnecting in a charming and oh-so convenient setting. This great beach house has been welcoming guests for decades, and your family will find it the perfect host for generations to come. Cannon Beach offers these nearby homes as well: Ocean Song, Sea Breeze, and Standing Stones. Would like to stay there again someday... will easily also consider other similar properties you may have.